Richard and I arrived in Lisbon earlier today for a five-week stay, which will include side trips to Porto and Coimbra to spend time with friends and a week in Ireland because we’ve never been there before and that’s how we fell in love with Portugal in the first place. We spent the day checking out some of our favorite places, buying a SIM card for my old iPhone with the broken camera, and watching the locals celebrate the European championship of Benfica for the third year in a row. Apparently, it never gets old! A busy Sunday night at Time Out Lisbon, near the Cais de Sodré and Ribeira das Naus. Richard was disappointed to see that the downtown location of Eric Keyser, his favorite French bakery chain, had closed, leaving only the less convenient (for us) Amoreiras location. (Fear not, love, there are multiple shops in New York City within a short subway ride and one soon opening in walking distance.) 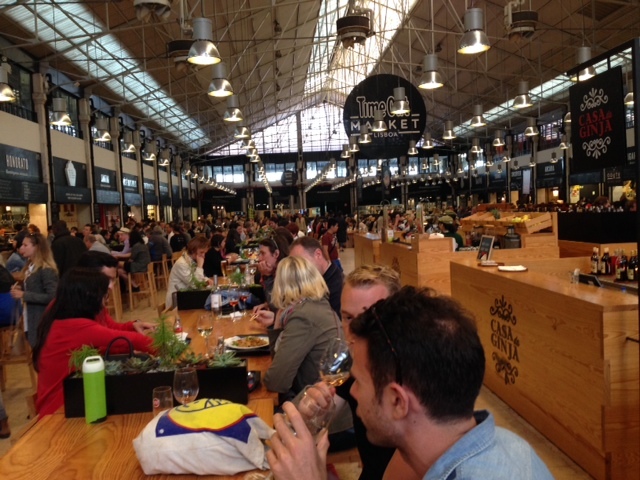 On the other hand, Time Out Lisbon, an excellent upscale food court, seems to have gained a large following, with every seat taken close to closing time on a Sunday night with lots of other things going on. 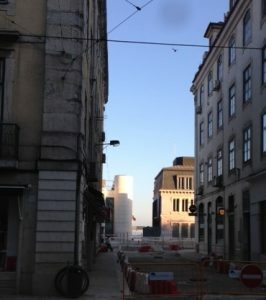 The park along the Ribeira das Naus and the Rio Tejo (Tagus River) is progressing nicely, with new buildings and restorations along the walkway. We look forward to seeing a free exhibit at the new Naval Museum on Portugal’s navy during the two World Wars. The old and the new, side by side, near the Ribeira das Naus. Seeing the changes made me think of my novel in progress and the challenges of researching historical events and eras. I intend to spend a lot of my time here doing research of various kinds, from sitting in the church that my protagonist and her family and neighbors attended to visiting Almada, the town across the river from Lisbon that grew up almost overnight in the mid-1960s, in large part because it got both running water and a bridge. Most of my novel takes place 50 years ago, in 1966, which was the year the bridge from Lisbon to Almada opened. In those days, it was called the Salazar Bridge in honor of the country’s fascist dictator. After Salazar’s death and the 1974 Carnation Revolution, it was renamed the 25 of April Bridge, commemorating the day of the revolution that brought democracy to Portugal after 48 years of dictatorship. In 1966, the giant square by the river, the Terreiro do Paço, was a giant parking lot. 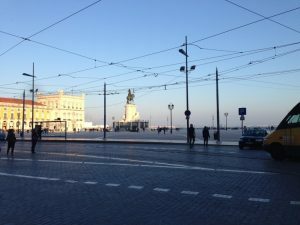 Today, cars are prohibited, and the vastness of the space draws attention to the statue at the center, except when grand spectacles or demonstrations take place there. 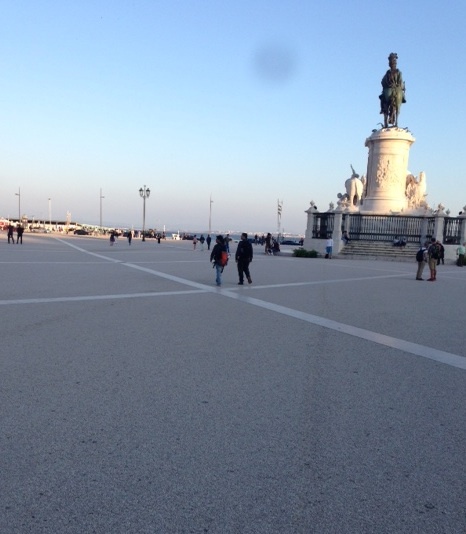 The Terreiro do Paço used to be a giant parking lot. No more. I try to imagine what my protagonist saw back then, at a time when many photos were black and white but people lived their lives, as they do today, in full color. As an author of historical fiction, I spend a lot of time in historical museums. 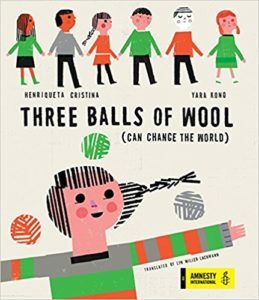 I’ve interviewed people as well, dozens of people for Gringolandia and Surviving Santiago, and I expect to do the same for this novel. I will probably be more open about the difficulties of getting books published traditionally in the United States, because my failure to disclose those difficulties cost me several friendships when the novel that would become Gringolandia didn’t find a home right away. It may mean that I won’t get a chance to interview some people who don’t want to commit the time to something that isn’t a sure thing, but I think most people want to help and want to make sure people understand and remember the world they saw every day, so many years ago. A parking lot no more. The dark spot near the top is where my old iPhone camera broke last year. Let’s use our imaginations and pretend it’s not there. I am waiting for something new on your blog and to hear more about your daily activities. A wonderful post, Lyn! 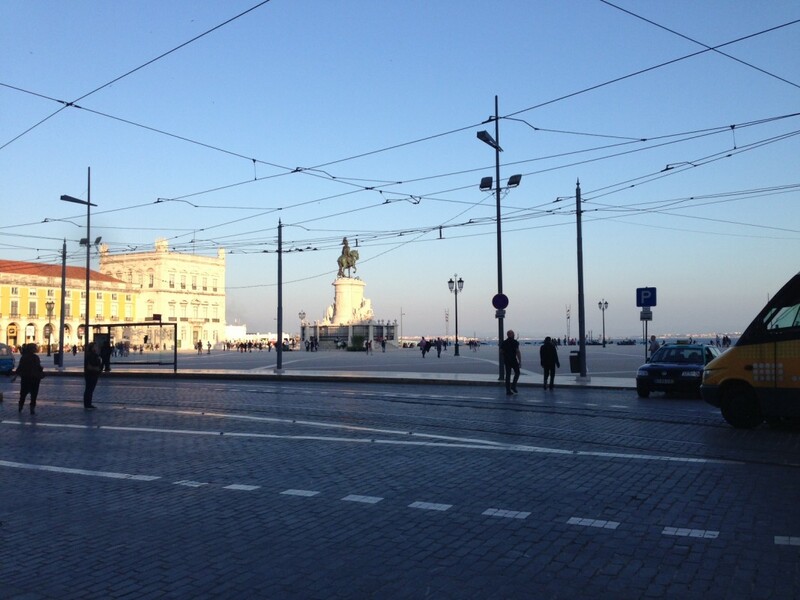 It filled me with memories of our time together in Lisbon. How fabulous for you to be immersed in the city of your current work. Good luck with it!